PART 1: Radical acceptance: We all have days when our emotions feel negative. Kids have bad days too. Judith Viorst had written the (1972) picture book for children, Alexander and the Terrible, Horrible, No Good, Very Bad Day. Alexander shared, “It has been a terrible, horrible, no good, very bad day. My mom says some days are like that.” His mom is right. Some days don’t feel good. These days are “cold” and “blue,” but what can we do? 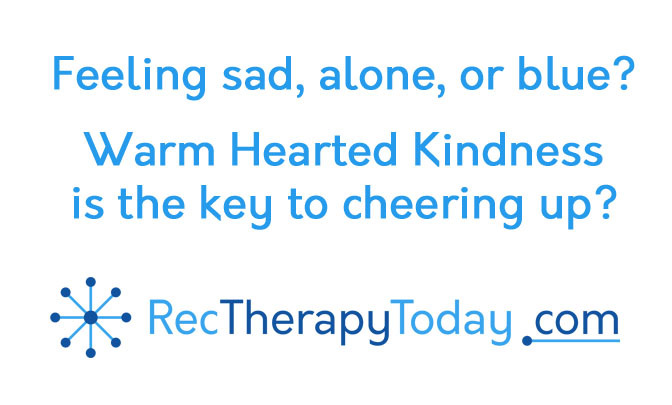 PART 2: Emotional regulation: Warm-Hearted Kindness can help turn our mood around. We recreation therapists teach people (clients/ patients) how to regulate their mood. We regulate room temperature to keep it stable. If it’s too hot, we turn on the air conditioner. If it’s too cold, we turn on the heat. If our mood is sad and cold, we can do things to feel happier and warm inside. Grieve (2000) suggested a lot of activities for cheering up. Doing good activities and deeds can help a person to feel better. Marsha Linehan (creator of Dialectical Behavior Therapy for the treatment of Borderline Personality Disorder) suggested contribution as a way to distract the mind and help a person to get through a difficult emotion. Contribution is doing something to help someone else out. Barbara Fredrickson (2009) book, Positivity: Top-Notch Research Reveals the Upward Spiral That Will Change Your Life argues that being kind increase positivity. Heather Porter posted at RT Wise Owls today a link to this research article: Rowland, L. & Curry, S. (2018). A range of kindness activities boost happiness. The Journal of Social Psychology, 27, 1-4. Rowland and Curry’s research included doing kindness activities for a week as well as observing kindness. PART 3 — How do you do kindness? Gary Chapman had outlined five ways to express love (for couples) in his (2000) book, The Five Love Languages. Chapman has followed up with books on improving other interpersonal relationships by using these same five love languages. Recreation Therapists could teach Chapmans’ five love languages as a way to show kindness to others. Use your words: tell someone you care about them. Practice it in group. Have group members give compliments too. Do a chore: help someone out by doing something good. Have group members identify how they could help a friend, a stranger, a teacher, a parent, and others. Quality time: spend some one-on-one time with the person. Listen to them talk. Be present with them. Ask them to spend some time with someone who is lonely. Give a gift: give someone handmade or something store bought. Do a craft project with the purpose of making crafts to give to someone as a gift. [Appropriate] touch: ask if you can give a side hug or a pat on the back or a high five. Are you able to bridge together different age groups? Can you have teenagers deliver care packages to nursing homes? Volunteer? Can you have the elderly to mentor younger teens? Our teens in residential care are creating encouraging posters for children in residential care. Our children are creating care cards for elderly in nursing homes. We’re then asking: how did you feel when you did these good deeds?